The age of co-operation beyond competition? Why is ‘competition’ viewed as a key driver in business behaviour? We so often hear business leaders say that they embrace sustainability or new ways of operating because it provides ‘competitive advantage’. 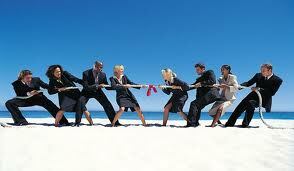 Is business life all about competition? ‘Competition’ as a word used to mean ‘striving together’ yet now it seems to refer to working against each other, separation and self-interest. ‘Cooperation’ refers to working together and forming relationships where each can benefit. Is this not what business is about, working together for mutual interest? Are not successful business models ones that work with partners, suppliers, customers, stakeholders and the like? We all know the importance of healthy relationships in business, yet overly-competitive self-interest can undermine the relationships we need to survive and thrive in these turbulent business times. It would seem our prevailing business mindset has become rather unbalanced in its focus on competition at the expense of cooperation. Perhaps this unbalanced view of competition goes hand-in-hand with our unbalanced view of what business and the economy is for. Traditionally business was about value-creation – creating value for others and so benefiting oneself: mutual interest and self-interest working together in balance. These days, with the focus on ‘maximisation of short term shareholder returns’ it would seem that ensuring ever increasing short-term returns becomes the goal rather than value creation for customers, hence self-interest becomes the over-riding factor rather than how business contributes value for the wider economy and society. So often we hear of business goals to ‘become Number 1’ or to ‘beat the competition’ or to ‘increase market share by x%’. While these may be useful targets, they are not exactly missions to galvanise people to passionately work together, especially in these challenging times. As Satish Kumar says in Resurgence ‘The purpose of the economy is not just making profit for one group at the expense of another but to create the personal, social and cultural wellbeing of all’. Working for an organisation ought to enhance the organisation, the individual and the people it seeks to serve, not simply ‘maximise the return for the shareholder’ which over-simplifies the purpose of business and damages its health and long term viability accordingly. It is a fallicy to think business has to be about self-maximisation at the expense of the wider economy, society and environment. Business can (and must) be a force for good, where it creates value for its stakeholders, benefiting life itself and in turn generating profit. Profit flows from value, not the otherway round – focusing on profit for profit’s sake is a school-boy error that is so often overlooked in our busy, confused, consumerist and parasitic paradigm. Yet fortunately there are many examples of quality business people and organisations operating with good business sense, where their wise actions drive real value from which healthy profit follows. ← Can leadership be inspired by nature? I am officially addicted to this blog. Thanks Beth, that’s an excellent article and is very much in line with my thinking on the social dimension of sustainability. The businesses we currently call our competitors should be our colleagues and rather than compete we should collaborate. They have the same problems we do, so if we collaborated and worked together we would find better solutions and in less time. They have, the same customers which means we can work together to develop better solutions to customer needs and at the same time use our points of difference to give customers all of both of us instead of most of one of us. They have the same suppliers which gives us the ability to work together with our suppliers to get better products, better service etc. The earthquakes we have had here in Christchurch have forced a lot of businesses that were once competitors to work together, and a good example I was personally involved in was with 3 motorcycle dealers on opposite sides of the same street. Two had their premises destroyed while the third was completely untouched, so they all moved in to the undamaged building. The shared workshop space meant the mechanics had access to the knowledge and skill of other tradespeople and the specialist (expensive) tools were able to be shared which meant they could work on a wider range of bikes. The shared showroom meant there was a fulltime receptionist which meant phone calls got answered faster, the shared stock meant, for example, when a customer wanted a jacket of a certain style and size that business A didn’t have, business B probably had what was needed. All three businesses did better working together than they ever did as competitors.